Citigroup and Bank of America settlements: Punishing banks is beside the point. Simply punishing banks is beside the point. What we need is real, constructive reform. 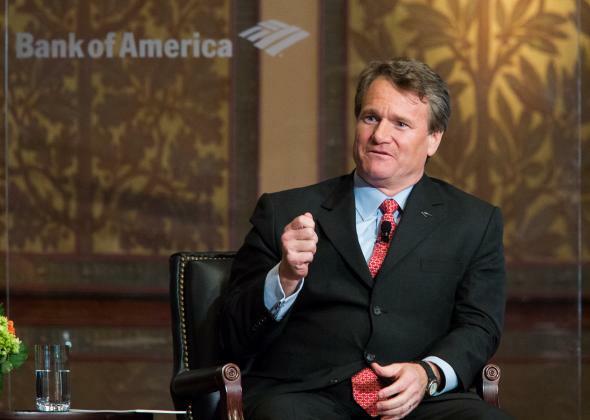 Bank of America CEO Brian Moynihan moderates a discussion with Warren Buffett at Georgetown University on Sept. 19, 2013, in Washington, D.C. Punishing bankers in the wake of the financial crisis is only one-half of the equation. Last week Citigroup finally reached a settlement with the U.S. Department of Justice over shoddy mortgage securities transactions in the years immediately before the 2008–2009 financial crisis. The bank agreed to pay $7 billion. That follows a $13 billion settlement paid last year by JPMorgan Chase & Co., and comes just as Bank of America is negotiating a settlement with the Justice Department sure to top $12 billion. In recent years, the Justice Department has excelled at extracting large fines from institutions that played a key role in triggering the last financial crisis. And the extraction process is not over. Currently, Standard & Poor’s—one of the ratings agencies that gave those mortgage-backed securities triple-A ratings—is grapping with a Justice Department suit, and other talks with other banks continue. But what exactly do these fines and settlements accomplish? Do they deter future “egregious” conduct, as Attorney General Eric Holder characterized Citigroup’s actions? Do they, as Holder further claimed, “hold the institutions and individuals accountable” and “bring some degree of relief to the people whose lives were affected”? Deterrence and punishment, as found in the current actions against Citigroup and Bank of America, may be needed at times. These penalties happen to coincide with the fourth anniversary of the passage of the Dodd-Frank Act, which was the crowning legislation designed to prevent repeats of the 2008–2009 financial crisis—the spirit of the bill very much lay in deterring and punishing destructive behavior. The problem is that neither deterrence (as defined here) nor punishment will generate future prosperity, nor will they help create a financial system that serves the needs of society. To be sure, these fines will bring some relief. A portion of those billions goes toward loan modifications for homeowners with underwater mortgages—Citigroup, for instance, will pay about $2.5 billion of its total for such relief. That is a large number at first glance, but it doesn’t mean as much when spread among millions of mortgages and families. And again to give Holder credit where it’s due, these fines also do hold institutions accountable—most notably in the recent settlement with BNP Paribas, in which the bank actually admitted criminal wrongdoing. But accountability isn’t the same as true deterrence. Fines—even enormous fines—that aren’t attached to meaningful structural reforms succeed in meting out punishment, but they do little to create a more dynamic economy where capital flows freely and cost-effectively to where it’s needed, when it’s needed. There is justified public anger about a financial system and large institutions that profited mightily from the sale of low-quality mortgages and derivatives while placing the entire financial system at risk. Punishment, as meted out to banks by the Justice Department, may satisfy a modicum of public outrage, but in the case of large financial institutions, fines and years of litigation will do little to create what we actually need: banks that can put capital in motion without creating untenable levels of risk. A useful comparison can be drawn to the American penal system. Punishment of individuals in prisons can accomplish a simple goal: to remove violent criminals from open society and prevent them from doing further harm. If imprisonment prevents them from reforming and doing subsequent good, that is a trade-off we are often willing to make. But when applied to large and systemically vital financial institutions, that trade-off is economically deadly. It does little collective good to punish banks for what they did in the mid-2000s if the goal is to have those banks serve a vital function in 2014. What we’re really missing is an incentive structure that makes it easier for banks to lend money. Many recognize that we have not done much to achieve this, or to invigorate the financial system in general. Free-marketers decry the web of regulations as the cause of both a sluggish economic recovery and the wariness of banks to lend. Legislators also understand that Dodd-Frank only begins the process of constructive reform. A bipartisan Senate bill co-sponsored by Elizabeth Warren and John McCain calls for a return to the Glass-Steagall era, when commercial and investment banking were separated. Yet even that proposal is still grounded in the prevention of future risk rather than the spurring of future loans and capital creation. To paraphrase law professor and former Obama official Cass Sunstein, what is needed is an approach that nudges financial institutions in a more constructive direction. That must take the form of both nuanced regulations (which is admittedly an oxymoron) and shifted corporate governance. The first step would be to re-establish the prominence of the word “service,” which is too often overlooked as part of the moniker “financial service industry.” Financial services exist to facilitate the free flow of capital to all who need it, for all purposes, from buying homes to paying for life’s necessities to corporate finance. Banks—and large banks in particular—need to be rewarded for doing that, and not just punished for doing it badly or not at all. Risk is an inherent part of the system, so eliminating risk isn’t feasible. Making sure the risk skews toward collective benefit, not private remuneration, should be the goal. As a result, executives at financial institutions should be rewarded for putting capital in motion in constructive ways. That has to start with boards, which need to create different compensation models that look at the outcomes of loans and not just loss ratios and stock prices. The free-market counter is that outcomes are reflected in the financial performance of banks. But the current incentives of compensation and stock price place more of a premium on deploying capital for higher return than from vanilla mortgages or consumer banking. On the flip side, the regulatory framework focuses so much on risk that it discourages banks from making many small business loans and other needed financing that is, by its nature, risky but vital. In addition to boards reconceiving the incentive structure, we could significantly expand the loan programs of the Small Business Administration. The SBA would provide more risk insurance for banks to put money in motion. As it stands, that agency works extraordinarily well, but it is too small relative to need. That in turn could provide a template for mortgage assistance that’s distinct from those in place at Fannie and Freddie, which package the securities rather than originating mortgages. Already many in Congress recognize that the backlash against subprime loans has made it very difficult for lower income brackets to get any sort of financing. To reverse that without the kind of risk of the mid-2000s requires more of the SBA approach in providing a backstop. As many applaud the fines levied by the Justice Department and the continued fleshing out of Dodd-Frank, let’s pause to recognize that we have accomplished exactly one-half of the societal equation: punishment. That may satisfy our sense of justice, but without constructive reform that puts capital in motion, it will not satisfy the deeper imperatives of a dynamic society lubricated by the free flow of capital.